Our product range includes a wide range of PVC Coated Aluminum and GI Sheets such as Designer PVC Coated Aluminum and GI Sheets, PVC Coated GI and Aluminum Sheets, PVC Coated Aluminium and GI Sheets and PVC Laminated Aluminum and GI Sheets. We have wide range of PVC Coated Aluminum and GI Sheets Off White Brown Khadi. We made these product with high quality. We provide these product at reasonable rate. In addition to this, these sheets are available with us in different sizes, and eye catchy in look. We are offering these in a wide range of sheets to fulfill the various needs of our valued customers. 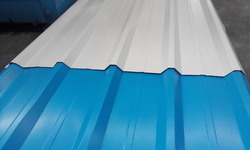 Owing to our reputation in the industry for optimum quality, we are involved in offering a wide range of PVC Coated Aluminum and GI Sheets to our valuable clients. These sheets are highly qualitative, as the superb choice for commercial space. The offered sheet is made of high grade raw material. We are offering these in a wide range of sheets to fulfill the various needs of our valued customers. With enriched industrial exposure and sound knowledge of this domain, we are engaged in providing an excellent range of Designer PVC Coated Aluminum Sheets. Used in a variety of products. Moreover, It can be formed for different applications, including those with T bends, without loss of coating quality. Major industries use prepainted metal in products such as building panels. 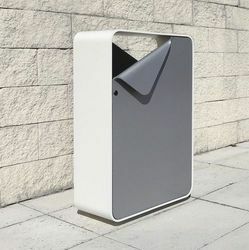 The list continues to grow, with new industries making the switch from post-painted to prepainted processes each year. Keeping in mind the diverse tastes of our clients, we provide these sheets in numerous sizes and designs. We are one of the leading names in the industry in offering a wide gamut of PVC Coated Aluminium and GI Sheets to our prestigious clients. Moreover, after the sheet metal passes through the rollers it is automatically sheared off at a desired length. The standard shape of corrugated material is the round wavy style, but can be easily modified to a variety of shapes and sizes by simply changing the dies. Offered range of sheets is made of the finest quality raw material under the supervision of th best industry experts as per the set industry norms. The offered sheets are strictly tested on numerous quality parameters to follow the global quality standards. Owing to vast industrial experience and knowledge, we are engaged in offering the best quality collection of Designer PVC Coated Aluminum and GI Sheets to our prestigious customer. Moreover, the dull-grey crystal structure of the zinc diffusion coating has a good adhesion to paint, powder coatings, or rubber. It is a preferred method for coating small, complex-shaped aluminium, and for smoothing rough surfaces on items formed with powder metal. These sheets are designed from quality approved materials. These sheets can be avail from us at reasonable rates to our valued customers. The offered sheets are sturdy construction, excellent in finish and alluring in patterns. Backed by our immense industrial experience of this domain, we are engaged in offering a wide array of PVC Coated GI and Aluminum Sheets in the market. These sheets are designed and developed for long service life and can withstand with varied weather conditions. The offered assortment is made from the finest grades raw materials and can also customize the design as per specifications given by our respected clients. Our clients can avail these sheets at economical rates from us. 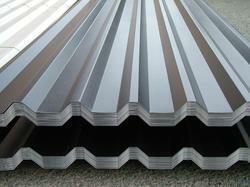 Looking for PVC Coated Aluminum and GI Sheets ?